I’m a stranger, a tourist, or a fleeting pedestrian—I could never be the familiar neighbor, that 10-year childhood friend, or a true resident, completely nestled into a particular society or culture. It is at lonely moments that I reach out to my family and friends through various networking technologies, especially Skype. 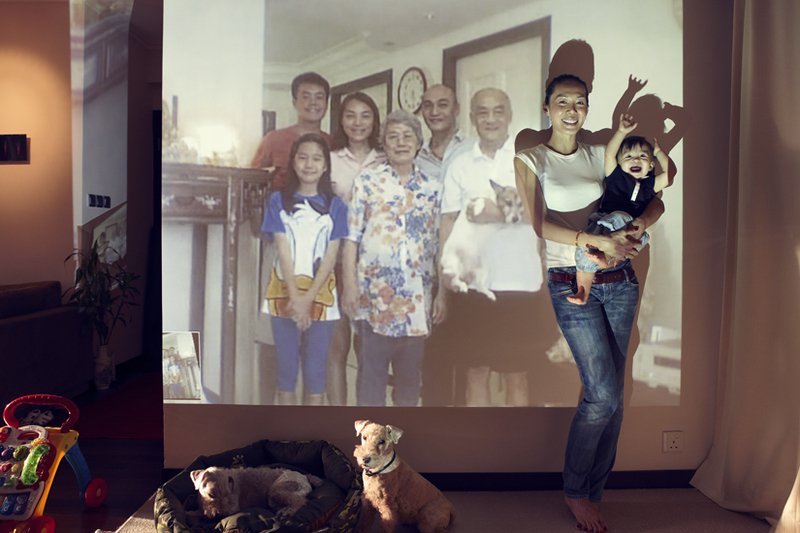 John Clang, a Singaporean photographer working in New York, uses this relational, online service to create a “live” family photograph, projecting a Skype video call upon himself, then photographing the resulting reunion. 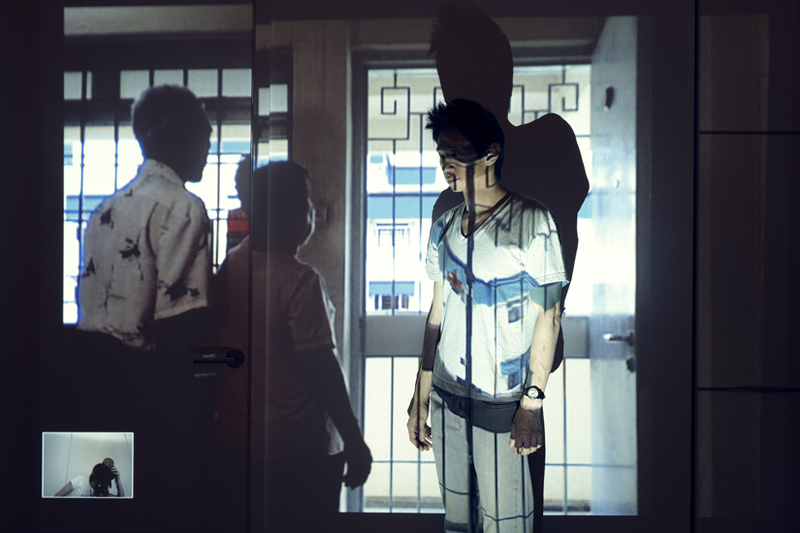 In a world where internationally torn-apart families have become a recurring trend, this project not only reflects upon the tragic displacement of our times, but also provides a touching remedy for these families. 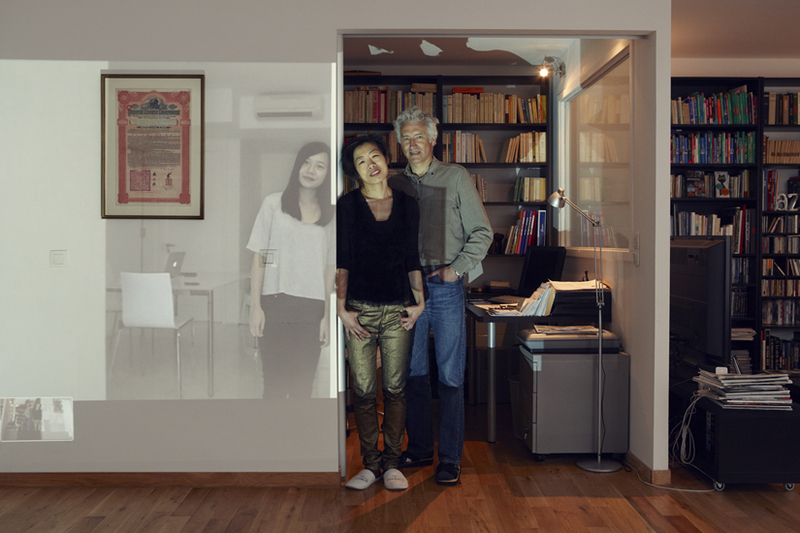 Through his series, Being Together, John Clang proves that time travel is indeed possible. Your international background seems to play an important role in the choice of your subject matter. Tell us a bit about yourself, and how your background translates into your photography. Being born and raised in Singapore, what I encountered was a constant flux of urbanization. That constant shift of changes, in terms of physical environment and society progression, plays an important role in how I observe my surroundings and my life; hence it has a great impact in my photography. Living in New York City as an “alien” also furthers my fascination toward strangers, [who are] often portrayed in my work. None of your fine art photography seems to be “traditional.” They are not the standard, shoot-and-retouch-for-contrast-tweaks photographs; they are quite experimental, and thoroughly played with. 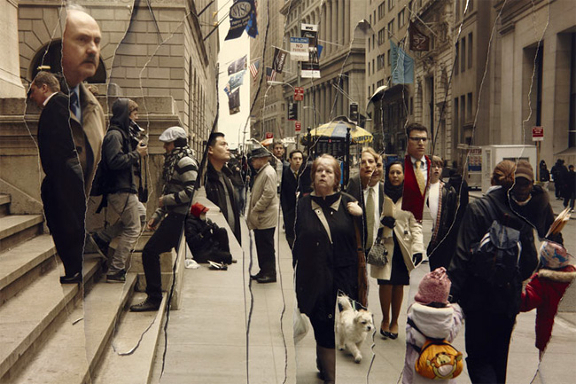 How did you get into mixed media photography? What inspires you to distort images in the multiple ways you do, and how do you come up with these processes/solutions? I have been an artist dabbling in the medium of photography for a long time. In some way, I am a purist: I want to expand the territory/perimeter of photography—experimental photography has never been on my mind. When I create a body of work, I want to be very involved, both at the mental stage and with the process. This, I believe, will allow the work to start breathing and resonate. I don’t use a technique because it’s interesting—I only use it because it has a linkage with the tradition of photography history, and it manages to express my emotion effectively. The emotional expression is important, more so than the visual appeal. What equipment, programs, and tools do you use to create your images? I don’t have a fixed process or equipment; to me, that’s the least important. However, I’m for the idea that one should be very well-skilled in his craft in order to create images that truly express his conscious or unconscious mind, without any compromises. So, with this in mind, I’m very particular about how things can be done, and how things should be done. Every detail matters. But I only use the skills I need, not the set that shows off a pretty image. A lot of your work deals with the reminiscence of a being or an image, as well as the act of “erasing,” or the elimination of the human face and figure. What appeals to you to these themes? 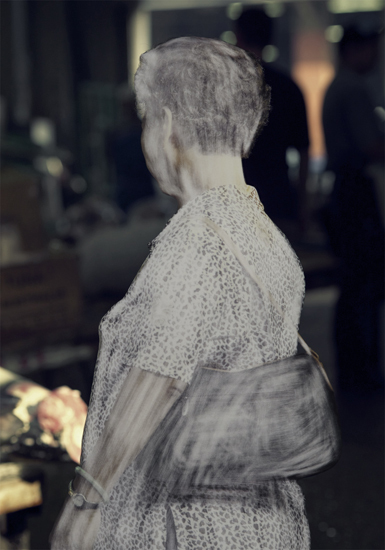 What was the inspiration for these projects, such as the “Erasure” series? I’m fascinated by time, strangers, and the idea of existence. So a lot of my work deals with all of these—constantly raising questions about my feelings and doubts, focusing about the past, present, and future. When I first had the idea of doing “Erasure,” I liked the idea of having the images sitting around for a few years before physically acting on them. The process adheres nicely to my fascination with time’s passage, reflecting the aging process of my parents and demonstrating how life starts to empty out at this late stage of their lives. It makes me wonder what I will be thinking of when I reach their age. It is such curiosity about our existence that triggers a lot of my work. Tell us about Being Together. Was there a specific incident with using Skype that ignited your idea for the Skype projections? How did you create the end images? Being Together is a part of an on-going series involving my family. I use the Skype process as a mark of our contemporary time. It is something that did not exist when I was a teenager, nor when my parents were my age. This technological invention creates a landscape that both my parents and I get to experience in our lifetime, truly making a mark of our time. When looking at the work, it makes me wonder how my parents feel when they witness such advancements in their late stage of life. I do feel a tinge of sadness with such thoughts. Maybe and hopefully, I will get to experience time travel in my own lifetime. The project was done live and not pre-recorded. It requires the family to use a webcam to record themselves, and then transmit [the video] to the location I’m in, so I can project it on the wall and direct them where to stand. The whole exercise allows the participants to experience the art process, and also embed a collective memory as a family in their head after the session. I feel Being Together could easily be translated into a unique, theme-based, photography studio, or even an online program or service, like Skype itself. How do you feel about online networking programs and services? Do you have an idea of your own in mind, if you were to invent one? I have never thought of this. Whatever I do is a reflection of my art process, so it never came across to how I can expand it as a service. But I do like the idea of keeping my work seemingly easy and possible for others to replicate. I’m not into complicated execution. I believe something simple—but well-conceived and executed—will resonate further, with much more sincerity and less pretense. Art needs not be a demonstration of skills, complexities, or even answers. It should be a door to further possibilities, exploration, and contemplation. Tell us about your future projects, and the mediums that you have considered using, but haven’t tried out just yet. I have been working on a new project that will be releasing for Paris Photo this year, and am still stuck with it. It has to with redefining landscape and existence in time. I’m currently reading/researching Unreality of Time by John McTaggart, hoping it will show me the light. Hopefully by the time this gets published, I will have the solution already. 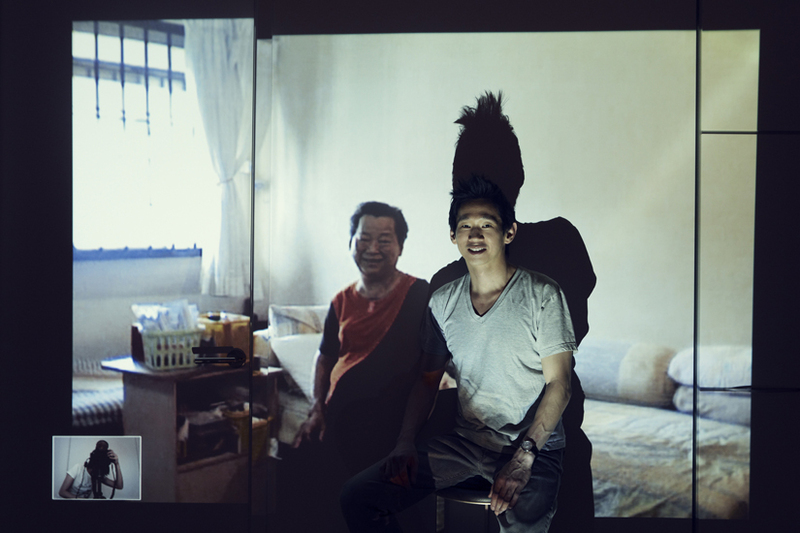 The full-on version of Being Together, a series of 40 family portraits, will be exhibited as a solo show at the National Museum of Singapore, in early 2013.